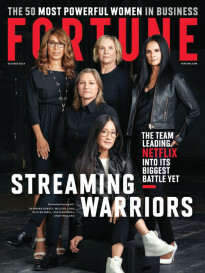 FORTUNE — Today Amazon (AMZN) revealed Fire TV, a streaming video box for television entertainment. The $99 unit, available for sale today, is part of the ongoing fight for the living room between the tech industry’s largest players. Fire TV competes with Google’s Chromecast, Apple’s Apple TV, Microsoft’s Xbox 360, Sony’s Playstation, and Roku. In a presentation to press, Amazon VP Peter Larson presented the bells and whistles of the small device and its software. It’s a slick interface which allows users to seamlessly stream content from Netflix, Hulu Plus, YouTube, WatchESPN, and of course, Amazon’s own Prime Instant Video streaming service. There’s also a big focus on gaming. Like with its in-house television shows, Amazon has begun developing its own games. They’ll be available through Fire TV along with around 1,000 other games (including the popular Minecraft).The Amazon system also features apps and photos, which can be synched from a smartphone or Kindle tablet. But perhaps the biggest surprise was what it doesn’t feature: Amazon’s own music streaming service. 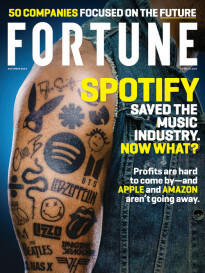 Market observers have predicted for months that Amazon would design its own music streaming service to compete with Spotify, Apple’s iTunes Radio, Clear Channel’s iHeartRadio, and smaller services like Rdio, Rhapsody, and Beats. It makes sense: Amazon already sells digital music through its Amazon Mp3 service, similar to iTunes. And it already offers a subscription service for streaming movies and TV. Why not put the two together and offer music streaming as part of its susbcriptions? MORE: In battling German unions, will Amazon emulate Wal-Mart? In February, Re/code reported that Amazon was in talks with record labels to do just that. And yet, Amazon today introduced Fire TV in partnership with Pandora (P) and iHeartRadio as its launch partners, and no sign of an Amazon-exclusive product. Either talks with the labels broke down, or Amazon wasn’t able to build the product in time. Perhaps the company will unveil its own music service in the coming months. As for today, the company is sticking with in-house TV, movies, and games, and leaving music to everyone else.